Leaving Clever Cycles, far and away the hippest and most-innovative bike shop I've ever visited I spied this lump of Mopar lurking in the old industrial / warehouse district. 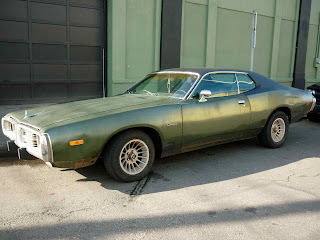 Mean and green, this Challenger SE is pretty representative of the cars that the "burnouts" / metalheads drove at my high school. It's also polar opposite of the human-powered "transportation solutions" I had just seen at Clever. 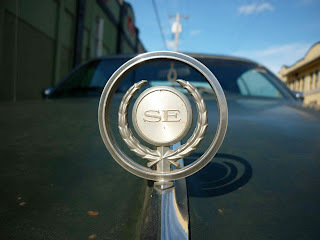 Ahh, a hood ornament. But with a quarter mile-long hood, the visual cue is necessary. 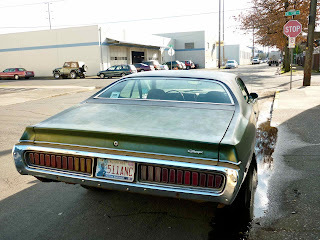 It's said of muscle cars that "only the green survive" as all of the "good" colors have already been mercilessly hooned to death, impaled on telephone poles along the rural highway or wrapped sideways into lampposts at the strip mall. 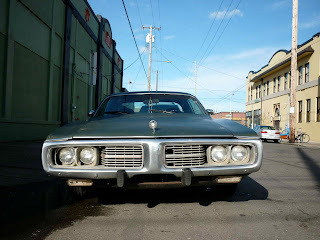 Few cars look as menacing as a '71-'74 Charger. Especially with faded paint and cracked lights. Imagine picking up a date in this ride. I'm certain that half the trunk space is compromised by an awkwardly-placed full-size spare wheel. Still good for hauling bodies though. 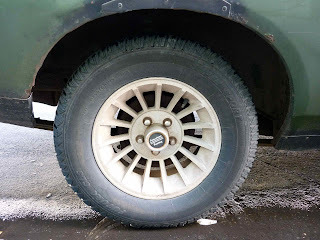 American Racing wheels wrapped with cheapo Pep Boys rubber. Light 'em up and let the vaporized tire combine with the cloud from that last bong hit for eau de stöner. 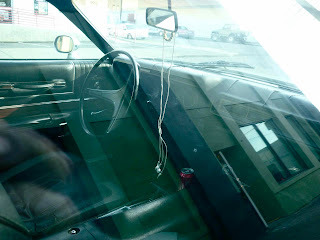 Ha - iPhone headphones draped from the rear-view mirror. I'm thinking this car doesn't have any Y&T or Iron Maiden tapes in the glove box.